Incident Details: A 48 year old man, walking with his partner, slipped, damaged his thigh and was unable to weight bear. 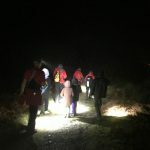 The Team set off to Rosthwaite with the first Landrover, whilst a local Team member went direct to the scene which was not far from New Bridge. The Team were able to stretcher him down to the vehicle, and he was transferred to Keswick Cottage Hospital for assessment and treatment. 10 Team members – 1 hour 16 minutes.